The pitching matchup between aces Jacob deGrom and Luis Severino never materialized last month when the New York Mets visited the New York Yankees. Severino saw his first start after the All-Star break pushed back to give him some extra rest. DeGrom was scheduled to start the series finale against Masahiro Tanaka before heavy rain postponed the game on July 22. DeGrom is making a case to be a Cy Young winner despite a 6-7 record because of the Mets' low offensive output in games he pitches. [post_ads]"Almost every game he's pitched in, one pitch can cost him the game," Mets manager Mickey Callaway said. "So I feel like all of those are stressful innings. The Mets gave their ace enough support on Wednesday afternoon when deGrom allowed four hits and struck out 10 in an 8-0 win over the Cincinnati Reds. The rare run support ended his five-game losing streak that he compiled in seven starts despite posting a 2.47 ERA. DeGrom lowered the best ERA in the majors to 1.77 ERA. He also turned in his 15th straight quality start, the longest streak by a Mets pitcher since Dwight Gooden's run from Aug. 20, 1985, to May 6, 1986. Gooden posted 11 wins in his streak of quality starts and deGrom owns three wins during his run, which is the longest active streak and the longest in baseball this season. This season, deGrom has pitched at least eight innings without getting a win six times. No other starter this season has thrown eight innings more than four times and the Mets have scored two runs or less in 10 of his starts. One of those outings was a 4-1 loss to the Yankees on June 8 at Citi Field when deGrom allowed three runs and four hits in eight innings. He made his major league debut in 2014 against the Yankees and is 1-4 with a 3.67 ERA in five starts against them. Severino was as dominant as deGrom through July 1 but has faltered of late, going 2-3 with a 7.31 ERA in his last six starts. 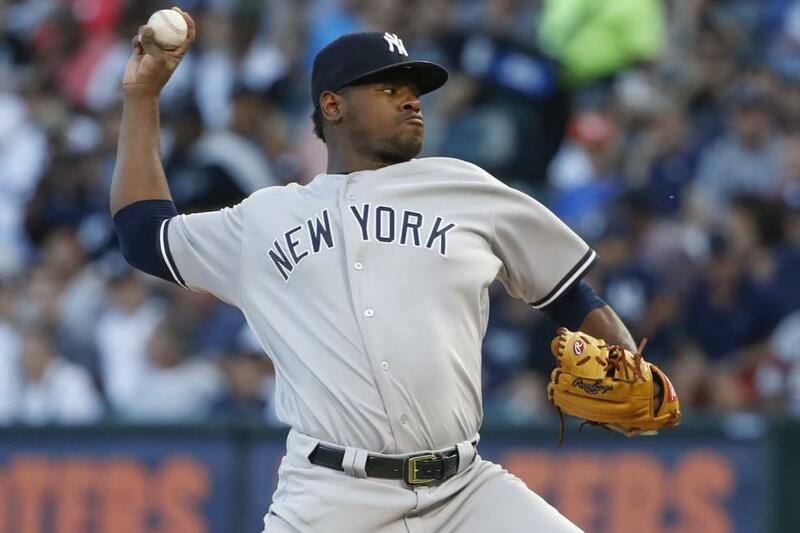 Severino last pitched in a 7-3 win over the Chicago White Sox on Wednesday when he allowed three runs and seven hits in seven innings. He struck out eight for the first time since June 26, which was the last time Severino completed seven innings before Wednesday. "I really felt like the tilt on (Severino's slider) was pretty good all night, especially as it wore on," Yankees manager Aaron Boone said. "It's such a devastating pitch for him." The Yankees are 19-5 when Severino starts. One of his losses was a tough-luck 2-0 loss at Citi Field to the Mets on June 10 when he allowed two runs and five hits in five innings. Severino is 2-1 with a 1.15 ERA in three career appearances (two starts) against the Mets. The Yankees have won six of seven after taking three of four from the Texas Rangers, capping the series with Sunday's 7-2 win. Giancarlo Stanton homered for the fifth time in six games and continues to wield a hot bat despite a tight left hamstring limiting him to serving as the designated hitter. Since Aaron Judge went on the disabled list with a fractured hand, Stanton is batting .281 (18-for-64) with seven homers and 15 RBIs. Since June 16, he is batting .333 (67-for-201) with 15 homers and 40 RBIs. "We're just seeing a large body of work now that's been really consistent, and I just continue to be impressed," Boone said. "Even if he doesn't have a great at-bat, he kind of never gives an at-bat away, and he's just been winning so many pitches over the last month or two that he's really making the pitcher work, and when he's getting his mistakes he's doing damage." Since the rainout, the Mets are 9-9. They won their second straight series Sunday when Jose Reyes and Michael Conforto homered to back Noah Syndergaard in a 4-3 win in Miami.